1. To prepare the glass, first mix the salt and chilli powder on a small plate. 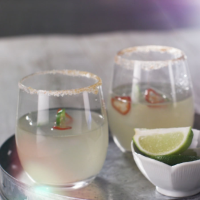 Run the lime wedge around half the rim of a round tumbler or margarita glass and then dip into the chilli salt. Add the ice cube to the glass. 2. Put the tequila, triple sec, line juice, syrup, jalapeño slices and brine into a cocktail shaker. Fill three-quarters full with ice and shake until well mixed and chilled. Strain into the glass over the ice.